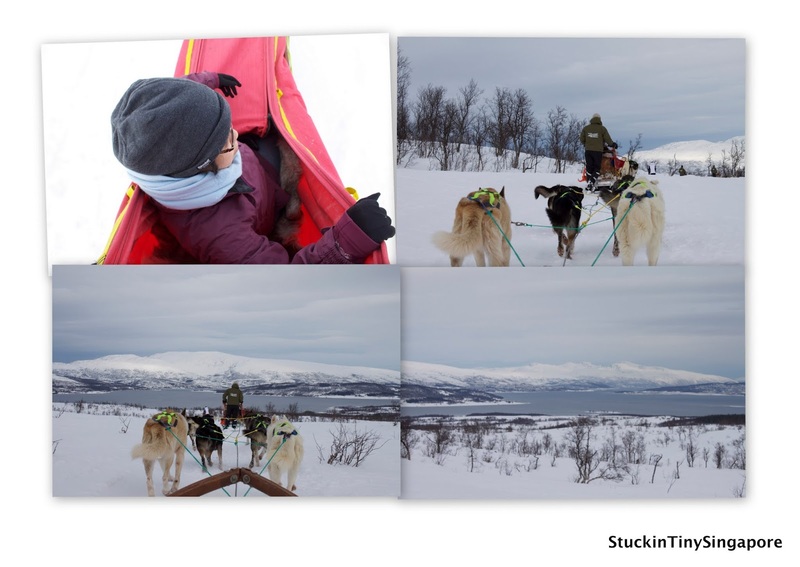 We had five days in Tromso, one of which we went to the Polar Zoo. Check out the blog entry. 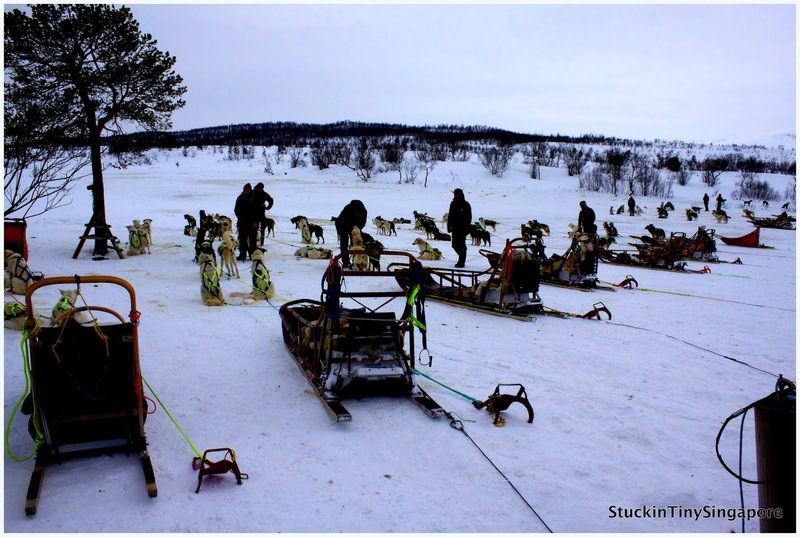 And another day, we went to do dog sledding. It is a great winter activity that you cannot miss when you are in a winter wonderland. Despite the high costs, it would be a wasted trip if we didn't go on it. 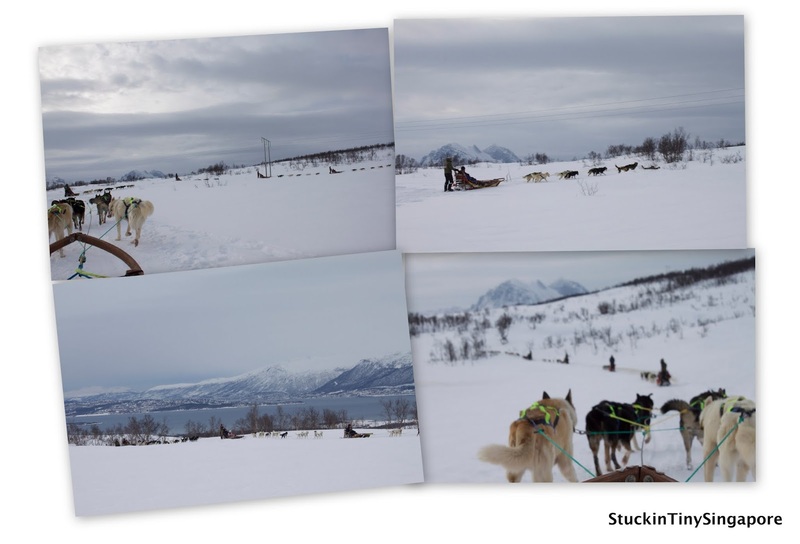 There was only a couple of companies in Tromso that do the dog sledding and we went with Villmarkssenter. 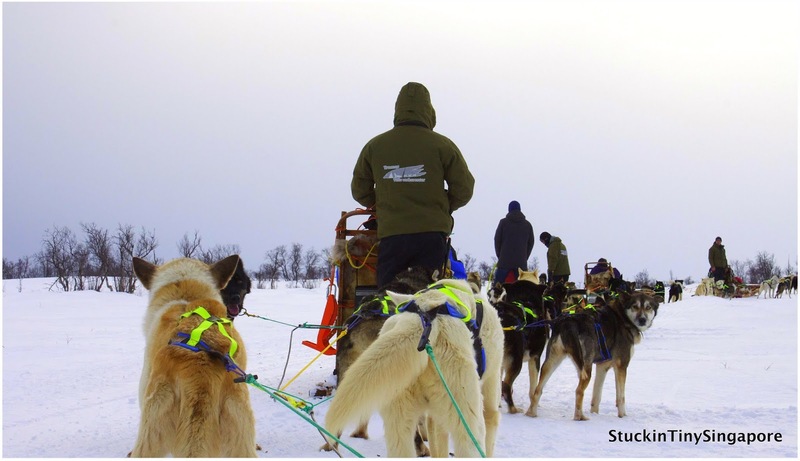 They are located around 25 minutes outside of Tromso and will provide pickup from Tromso City Center. Villmarkssenter provides a range of programme to choose from ranging from daytime or evening dog sledding, to Northern Lights viewing to Staying at the Aurora Camp where you get to spend a night in a Sami tent sleeping on reindeer fur. For the more active ones, you can also go on a Snowshoe trek or on the longer Dog sledding expedition. 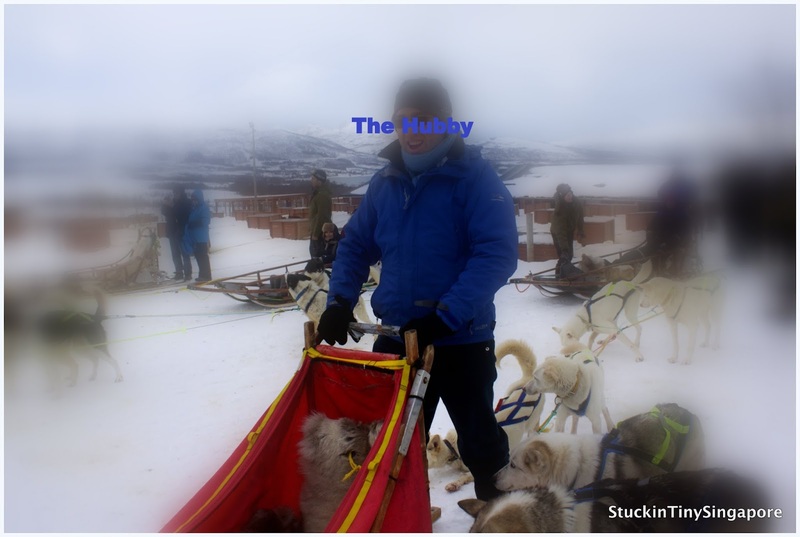 The husband and I decided since we were already going on a Northern Lights hunting trip, we would go for a daytime dog sledding so that we could enjoy the scenery while enjoying our sled ride. The trip costs each of us 1490NOK or SGD$325, not a cheap expenditure, but hey it's once in a lifetime right? What is the point to travel all that way there and not try it out. Burnt pocket aside, it was worth every NOK? We were met by the bus where we were picked up with a big bunch of tourists. 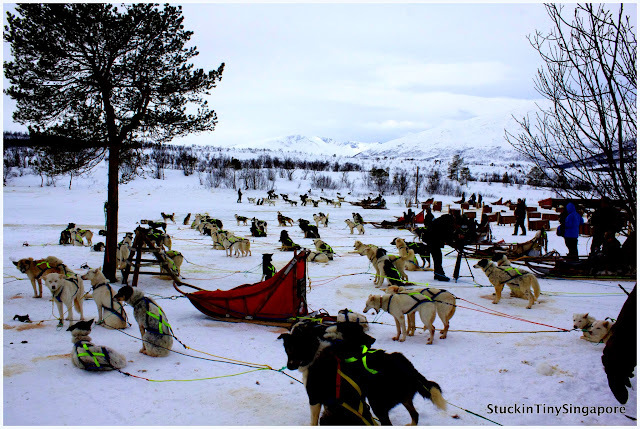 There were at least 35-40 of us and we were worried that how could there be enough of dog sleds to go around?? Anyway, the bus trip took around 30 minutes before we reached the Villmarkssenter camp. For those who weren't dressed up warm enough, they did provide extra external overalls and snow boots. After all of us were warmly dressed, we went out to meet the dogs. There were at least a few hundred dogs out there, two chained together to a kennel. As explained to us, the dogs were Alaskan huskies. The Alaskan husky is not a breed of dog rather a mix of various breeds to give the best and most efficient sled dog and because of that, they tend to vary greatly in personality as much as in colour and appearance. On the whole though, they are very affectionate and love to cuddle with other dogs as much as people. They are incredibly active dog and love to run which is what they are bred for and believe you me, they can run, so much so, you really have to use your brakes on your sled to stop them from running. 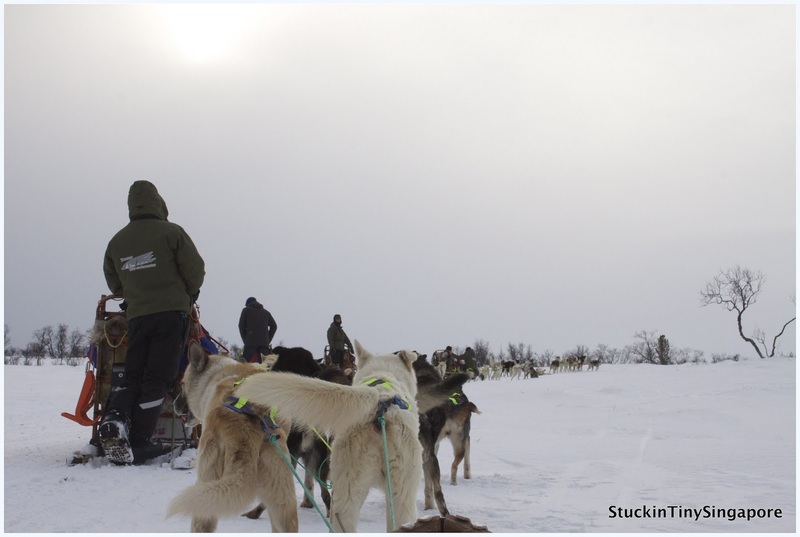 Remember that I mentioned that there was a big bunch of us, and was wondering how they were going to have enough dogs to pull all the sleds for us. 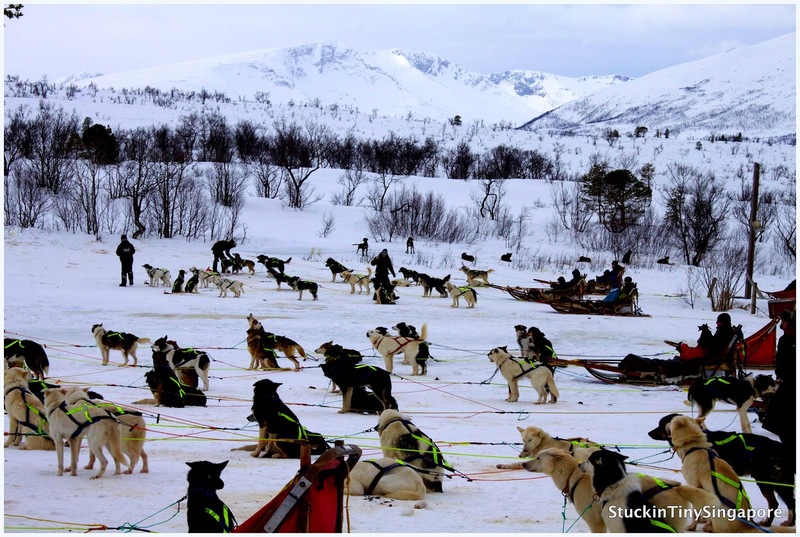 For each sled, you would need at least 6 to 10 dogs, so you would have at least 15 sleds with 150 dogs?? 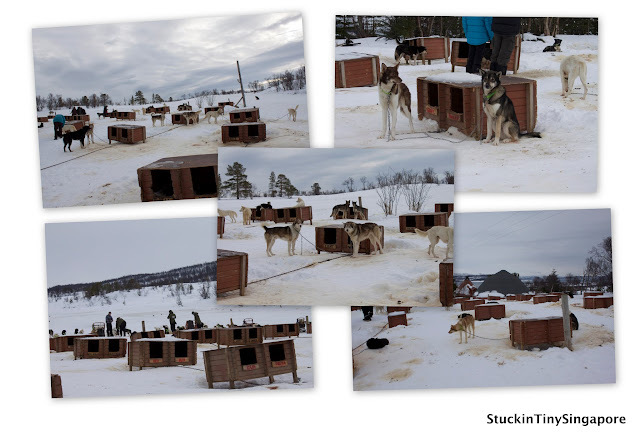 In the end, they split us into 2 groups, one went dogsledding first while the second group went to see the puppies!! Yes there were puppies. More of that later. The air of anticipation and excitement was electric. You looked across and you could see 20 sleds all ready with the dogs rearing to go. The dogs were barking and it was almost deafening. You had the choice to either just ride in a sled or do your own driving. 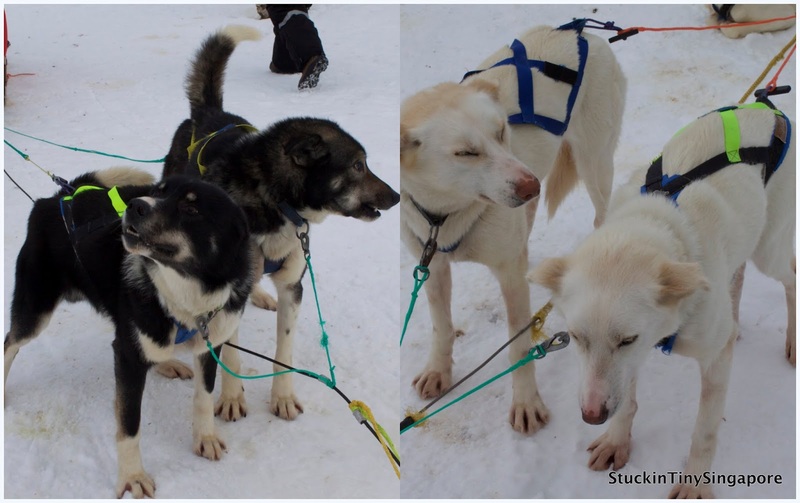 If you wanted to just ride, you would be in a 2 person sled pulled by 10 dogs and a staff would be doing the driving. My husband and I chose to do our own driving and that meant that we were in a one person sled (me sitting inside first) with the husband doing the driving with 6 dogs pulling us along. Dog sleds all ready to go. Finally when they got everyone into their sled, we were off. The bigger sleds were off first and they slotted the self-driven sleds in between the sleds driven by the staff. They were always keeping their eyes on us. 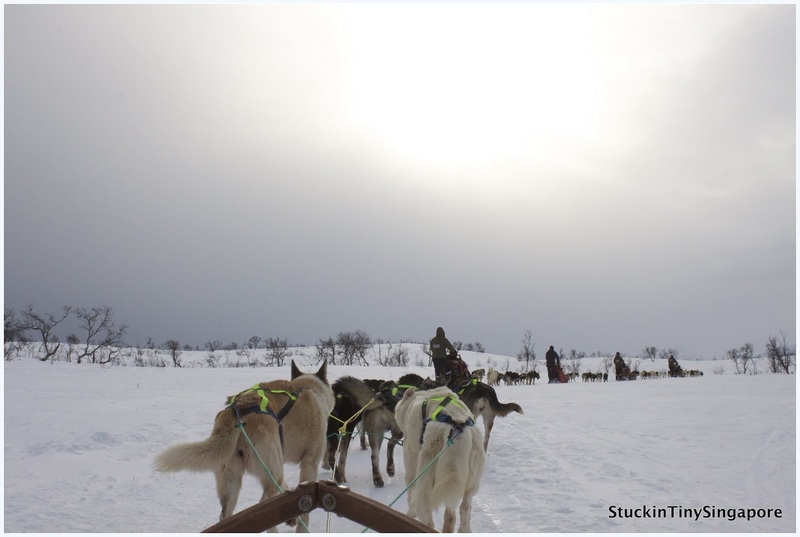 It wasn't easy to lead like 20 sleds off on the trail. 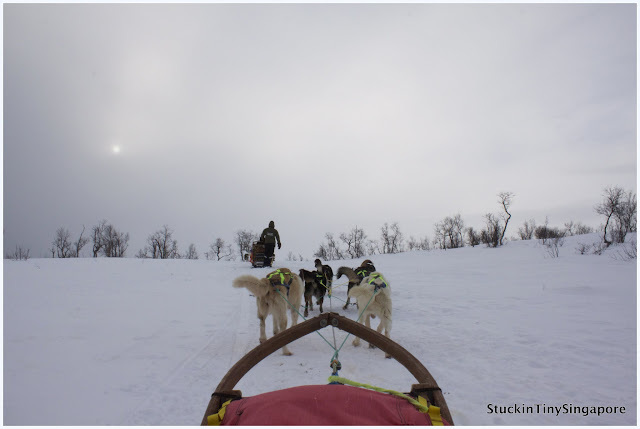 Every so often, we had to stopped to make sure that the chain of sleds were not broken. These dogs love to run and I could see trying to stop the sled, the driver used his whole body weight to step on the brakes which worked by burying into the snow. Even that took awhile for the sled to come to a complete halt. The plan was to drive for around 20 minutes and you would come to the mid-way point where if you wanted, you could switch over. I decided to continue my ride rather than drive as I didn't think I weighed enough to be able to use the brakes efficiently to stop the sled if needed too. Yes I know I am a wurst, but I preferred that then the picture I had in my head, whereby a distance scream was heard, and that was the hubby and I being pulled by the sled downhill, unable to stop. 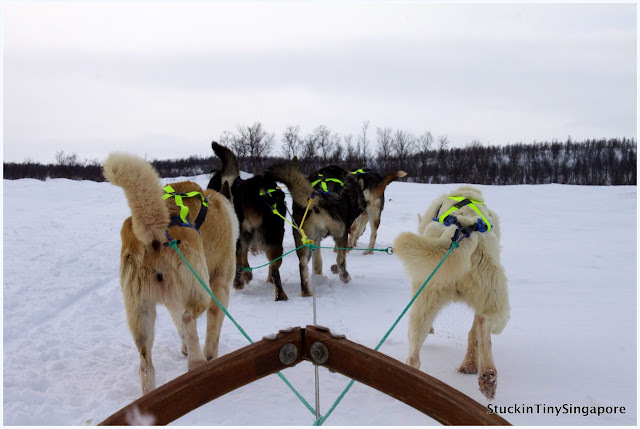 The feeling being in a dogsled is exhilarating! The wind in your face, the scenery all around. But they forgot to tell you about the smell!! The dogs were able to run, peed and pooed at the same time, which means you were getting hit by the smell all along the ride. I guess the scenery made up for it? Despite the smell, it was a great experience after all. I think the driving is more fun, you are standing up and the view must be better up there? The hubby kept checking with me if I was alright. Am I too cold? Nope, the sled and the reindeer fur inside kept me nice and snuggly warm. I was able to take loads of pictures along the way. After the ride, we came back to the camp for the second group to go off on their rides. We went back to say hi to the doggies and meet the puppies. The puppies were super adorable. I didn't get to carry one but it was alright as then you would want to carry one home with you! Lunch was served at the Sami tents, which was very authentic. We were served a lovely warm reindeer soup followed by some beef stew and a chocolate cake. The tour ended with the bus taking us back to where we started. For over 300 bucks, it was very expensive, as were everything else in Norway. If you were going elsewhere that do offer dog sledding, do take the opportunity to try it out. It is super fun and highly recommended. More doggies. Super affectionate ones. 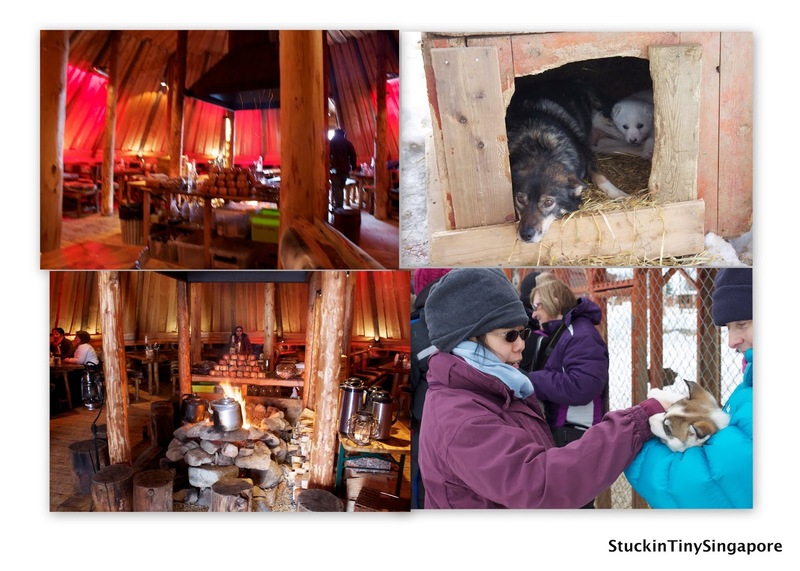 Lunch in a Sami tent and puppies! Finally, here is a video I took during our dog sledding. Enjoy. Till the next post - One of the simplest ways to stay happy; just let go of the things that makes you sad.